I picked up this cheerfully bright blouse from Heidi Merrick last month and have been wearing it casually with jeans, but the second I got this striped skirt in the mail from ASOS last week I knew it was a perfect pairing! The tailored pleating on the skirt combine with the flirty bow on the blouse for a fun, feminine ensemble. Did I mention the skirt is under $60? Total steal, and it will look fabulous with tanks and tees in spring! Some other recent purchases from ASOS right now are this high-neck top and this printed midi dress. Yesterday I was looking at that skirt, it is so pretty and that red top is fabulous. I got that printed dress as well but did not like the fit and length on me. You seem taller so I bet it will look gorgeous on you. I have been eying this skirt on Asos, it looks great on you! Love it paired with this top! This blouse is absolutely gorgeous – such a classic & chic piece you can wear for years to come…not to mention, the color is amazing on you! That skirt is SO tempting — love it with that shirt + shoes! That skirt is fabulous! I love how it can transition to spring very easily and that red is SO your shade, it looks fantastic! Oh gosh for someone who loves stripes this skirt is perfection! Love this outfit! I’m really glad you posted the skirt. I’m surprised to see that the stripes vary so much from the stock image, but I still really like it. Love everything about this! 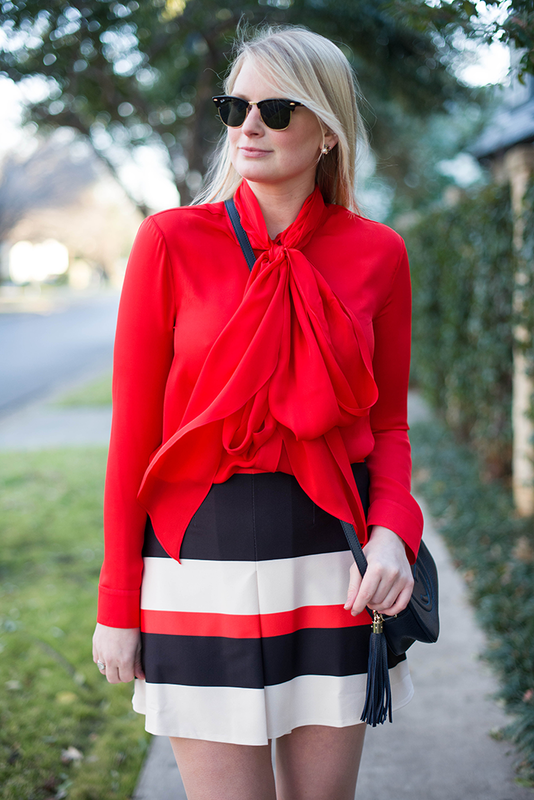 The red of the blouse picks up the red in the skirt perfectly, and the flirty bow is so fun! Omg I LOVE it! One of my favorite outfits ever! Red is definitely your color! Beautiful, Merritt! I love finding a good steal on pieces like that!!! Great color palette. I like the brightness of this outfit. So flirty and feminine. I love this!!! what great colors- that striped skirt is a beauty! I love this skirt and how you styled it. This is one of my all-time favorite outfits of yours!! The blouse and skirt were made for each other! Guess what? I LOVE every single piece you’re wearing! love, love, love. Hello fabulous!! Love this look!! The skirt is too cute and I love the bow blouse. You look fantastic! You are so gorgeous. And the bag is fabulous. You look gorgeous! I love those Ray-Bans – I wear mine almost every day! LOVE this skirt! Your pictures are gorgeous and I love the bag!! that oversized bow slays me. have mercy! Fab outfit and I love the fact that the stripes are different colors than usual. Beautiful as always! the blouse is sensational. I love everything HM designs. I bought a camo dress of hers like 7 years ago….I think she was just starting out. She has such fab taste. You look so cute! Gorgeous. I love this skirt and jacket. Perfection!! 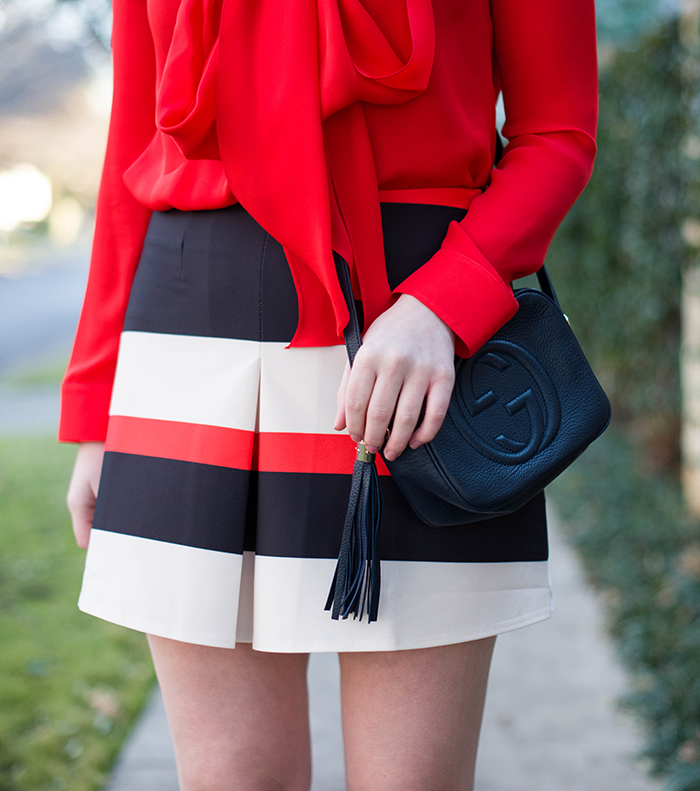 The pleat and lines of this skirt are perfect! Great colors too…love the way you put it together with the red blouse and amazing Emerson Fry coat. Love your Gucci bag. Great look! Oh, this look is really great. Just found your blog and I’m loving it. That bow blouse is AMAZING, you pull it off so well!! Well, this blouse settles it. You should wear red every. single. day. It looks amazing with your skin tone.